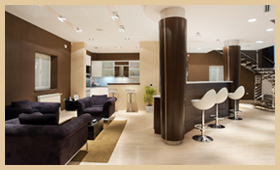 The Basement Renovation Group offers an interior design service. When a basement project such as a Bachelor apartment, a home theater or even the development of a professional office is planned it is worthwhile to invest slightly more in design in order to create maximum visual impact. We have in our Group interior designers to suit all budgets, from someone graduating at a reputed school in Montreal in interior design to the experienced specialist who has done the interior design of prestigious homes in California. Mr. Daniel Dargis, Engineer and general contractor since 1989, leads the group of design and basement renovation professionals such as: interior designers, architects, engineers and general contractors at your service for your basement project. creating a more relaxed working atmosphere between you and the contractor knowing what you are looking for. Whether it is for a home theater, a Bachelor apartment or another basement renovation project you are going to enjoy or that will allow you to increase your income, a designer has its place. The eye, the talent and experience of an interior designer will easily detect interior design elements to use in transforming the space in the basement of your dreams.